Try something new when you make these Cheesy Mini Meatloaves with Salsa. 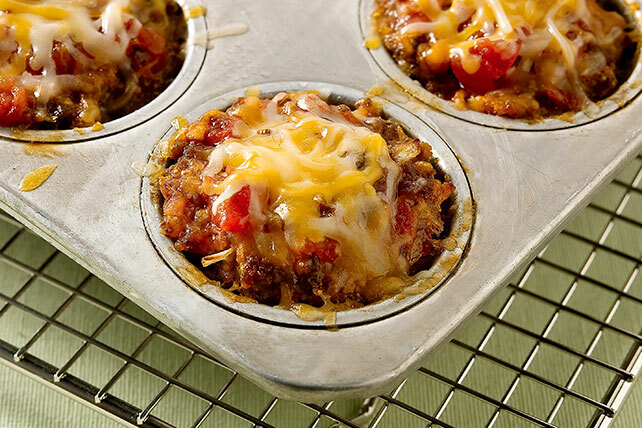 These Cheesy Mini Meatloaves with Salsa are meatloaves with a taco twist! Mix first 4 ingredients with 1 cup cheese and 1/2 cup salsa just until blended. Press into 12 muffin cups sprayed with cooking spray. Use back of spoon to make indentation in center of each mini meatloaf. Place muffin pan on foil-covered baking sheet. Serve with a slice of whole wheat bread, and a mixed green salad tossed with your favorite KRAFT Lite Dressing to round out the meal.